The devastation in Nepal on April 25 has brought back memories of the 2011 temblor that caused extensive damage to property in the Darjeeling hills and comes as a wake-up call to not only the civic body and the district administration but also the residents. 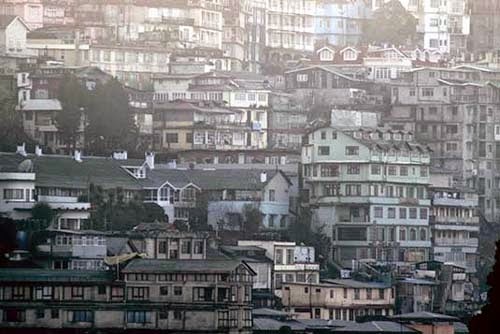 The Darjeeling municipality has begun serving notices to owners of high rises in town, with the district administration seeking reports and the “janta” (citizens) putting up posters demanding the demolition of tall structures. The civic body conducted a survey last week and has identified 18 buildings in and around Darjeeling town to be flaunting the permissible 11.5m limit in the hilly region as per the West Bengal Municipality Act, 1993. “The survey conducted by the municipal engineer found 18 buildings exceeding the permissible 11.5m height limit. So far, we have issued notices to two owners to demolish the portion exceeding the permissible limit,” said Darjeeling municipality chairman Amar Singh Rai on Monday. The civic body has identified only 18 tall structures, but a closer look of the town area tell of a different story as much of it is inundated with tall and massive structures. “Going by past experience, we are well aware that owners will not give heed to our notice. This time, we want to shake them up from their slumber,” Rai said. The move comes after Gorkha Janmukti Morcha president Bimal Gurung held two meetings near Mirik with chairmen and commissioners of the four municipalities in the hills following the quake in Nepal. In 2012, the municipality started regularising “illegal” (structures above 11.5 metres) buildings with hefty fines to dissuade people from constructing high structures. The municipality chairman also said the state government has set up a state-level building verification committee, especially for the Darjeeling hills and the committee is expected to visit the region soon. “The committee members are expected to visit the hills to conduct a survey of the buildings here. If they find any building flaunting the rules, they will definitely issue dismantling orders,” Rai said. Meanwhile, district administration officials said they were not aware of the committee or any impending visit. “I am not aware of such a committee or the expected visit as I recently joined office,” said Darjeeling district magistrate Anurag Srivastav. Posters demanding demolition of structures above 11.5 metres in height pasted across town by the “janta” also drew flak on the civic body. “The tall and heavy illegal structures may not cause harm now but they will definitely so after 20-30 years once the buildings weaken. The lives of many people will be at stake. The corrupt municipality is to be blamed and such structures demolished immediately,” reads one of the posters pasted in the premises of the Darjeeling municipality.